It's that time on a Monday again: here's the delicious downloadable delights dished out today, hoping to separate you from the numeric currency locked away within your DSi and Wii consoles. Play with Birds (Games Farm, 500pts) — A mix of avian-themed minigames that takes you through the life of a cartoon bird that moves to a city, finds a partner and settles down, and all with nary a slingshot in sight. Look out for our review flying in this week. 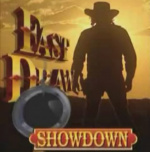 Fast Draw Showdown (Digital Leisure, full version: 500pts) — Try the "classic" full motion video-powered arcade shooter for free in your own home, then read our Fast Draw Showdown review and keep your Wii Points card in your holster. Art of Ink (Sabarasa, 800pts) — A tattooing game from Sabarasa, the publisher behind the rather good Save the Turtles, this one has some interesting art design behind it at least. We'll bring you a full review in the near future. Slingo Quest (MumboJumbo, 800pts) — The first downloadable effort from DS puzzle farm MumboJumbo, this is a combination of slots and bingo that offers 50 levels and a range of minigames and power-ups to keep you entertained. We have just the man for the reviewing task at hand, so stay tuned for our verdict. Escape Trick: The Secret of Rock City Prison (INTENSE CO., Ltd., 500pts) — Winning this week's "Most Awesome Game Name" award, this is a take on the popular room escape games that aims to combine puzzles and story to create a compelling narrative. We'll bring you a review in the coming days. Ready for a new hand-held game that's sure to get under your skin? 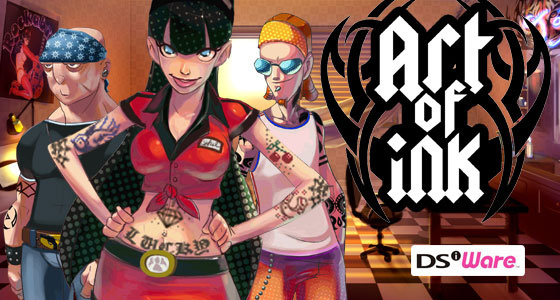 Art of Ink for the Nintendo DSiWare™ service invites players to flex their creative muscle by designing memorable tattoos for a colorful range of clients. Meanwhile, Slingo Quest offers a super-charged brand of puzzle-based fun, combining slots and bingo. A new prison-break adventure rounds out the latest Nintendo DSiWare offerings, while fresh additions to the WiiWare™ service include cartoon birds and a demo version of an engaging Wild West shooter. 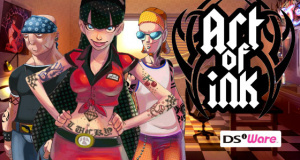 Description: Submerge yourself in the colorful world of tattoo art. Working in one of the most prestigious studios in town, you can turn your stylus into a tattoo machine and work with precision on your clients to give them a piece of your art. But be careful - it's not just the art you have to deal with. Satisfying your customer takes more than just skill with your inks. You must get to know the crazy cast of characters that comes to your shop and give each client the perfect design. Keep your clients happy and make a name for yourself to eventually open your own shop and customize it to your liking. Other tattoo artists will take note of your success and will challenge you to prove your skills. Defeating them will give you an insight into their techniques and help you become the next tattoo master. Description: Slingo Quest combines two classics - slots and bingo - in the ultimate puzzle game. Spin the traditional five-reel slot machine, then match the numbers on your cards (across, down or diagonally) and hit a Slingo. Create as many Slingos as you can in 20 spins with the help of fun power-ups. Fun game modes include Multi-Card Slingo, Seven by Seven Slingo and Pirate's Fortune Slingo. Collect cool power-ups, including Slingo Vision, Devil Protection and Multipliers. Play through 50 fun levels of Slingo, collecting Slingo Stars and Stamps for big bonuses. Are you ready for the next Slingo challenge? Description: The Rock City Federal Prison is known as a giant coffin, locking up death row inmates and lifers with no parole. Roy is locked up in cell 218 on a 10-year term. He knows he was framed. A false accusation, mysterious cash left in the prison cell, a breakout plot by prisoners, a warden who is nice only to Roy, the mysterious death of the old man who died in a hole six months ago - is this a conspiracy? Now, the unprecedented jailbreak begins. Escape Trick is a "breakout adventure game" in which players use the stylus to search, use and combine various items in the cell and attempt to escape. Not only the items, but also the letters and symbols in the room can be significant hints for a breakout. In addition to the quest, unique characters get involved with Roy in the adventure part of the game. Roy's secrets and the mystery of the prison are revealed as players progress. Description: Play with Birds is an original cartoon bird game for players of all ages. Fly through the city and play dozens of bird minigames, including Birdman, Catch Thief and Bird Race. Become famous and find a bird to build a nest with. Play with Birds is focused on the lifelong adventures of a small bird in a city, from hatching to finding a partner to building a nest and establishing a family. Description: When it comes to fast draw, there are only two types of people: the quick and the dead. Now you have the chance to find out where you stand - or lie, as the case may be. Go up against the best quick-draws in the business, including one of the world's fastest, Wes Flowers. Unholster your Wii Remote™ controller and show 'em who's really the fastest draw in this live-action shooter. You can even take on a friend in multiplayer modes and see which one of you has the quickest draw. (Additional controllers are required for multiplayer modes and are sold separately.) You'll need some serious speed and awesome accuracy to take on these gunslingers. Lol, I just said we needed a bird game.. and what is this? I just finished watching Rango, I'm in a shootin' mood. Demo here I come. Oh forgot to say, OH NO, NO VC the world is ENDING! There we go. The eShop can't come soon enough! @KaiserGX After reading your first post I thought you'd gone insane. Thank goodness you realised your mistake and restored normal service promptly. Good work. I'm not really looking forward to anything (Maybe Pokemon Mystery Dungeon but that is never going to come now), I actually forgot today was Monday. I have no points anyways. This is a pretty bad update for Wiiware/DSiware imo. I really like the new genre that they've created for Play With Birds, "original cartoon bird game". Oh my god yes! So much more great stuff to spend my money on! Woot! I can't wait until next week when 3 more pieces of ^%*$ come out because I love spending money!!! I am going to go buy a DSi right now so I can catch up on all the awesome stuff that has come out for it's online service right now!! I've always wanted 300 different clocks, calendars, and calculators! Now's my chance to own them all!! YES!!! I don't even need the Fast Draw Showdown demo, I am just going to buy it as I'm sure it's awesome!! YES!! tbd will loooove Art of Ink. modes and are sold separately.)" Fast Draw Showdown was one of the first WiiWare games I downloaded I don't know what I was thinking. Oh effin come ON. Where the hell is FF6? Donde esta Chrono Trigger y FF3? This would be a great update if I wanted to to waste some Wii points! What was the last VC game that even interested me? Startropics 2? And now we hardly get any VC at all. WiiWare is a bit better, but it's so easy to miss the good WiiWare games when you have to pick them out of the weekly onslaught of crap. I have Slingo Supreme on my iPhone and while it is a bit addicting for a while, it is just a slot machine. It's addicting for the same reasons that slot machines can be, but they aren't terribly good reasons. I got Slingo for free on my iPhone and for that price it was worth it, probably worth it even at $1. I really can not see paying $8 for the privilege. I like the demo choice, but the new WiiWare release is once again crud. Where are the WiiWare FPS games we were promised? At least give us Bobby Carrot Forever soon (the day after Easter? ), as that one at least has potential. Why is NA always the last to get anything good? To be honest, I wasn't even expecting FFVI this week....yes, I've learned to expect being disappointed every Monday, but when I learned about the SNES classic controller that plugs into the Wii remote, that just broke my heart even more. @Pixelman: Instead of complaining each week try these steps. 1). If you dont already have one purchase either a SNES or Playstation. 2). Purchase either FF3 on SNES or The Final Fantasy Collection on PS. Problem solved and now you wont have to wonder or complain about it coming to VC. I agree. Despite the %&#@*ing I myself do, I can at least admit that it makes a lot more sense to either hook up an old system, or completely track one down, buy it, and then hook it up in order to play older games. NO VEE CEE FOR YOU!!! @27. Oh that's a wonderful idea. I can spend 50 bucks on a beat up old cartridge with a save battery that's almost dead and hook up another system that I totally have room for. Or Square could release the ROM file on the VC here, like they did in Europe, and actually make a profit on my purchase — which would be 42 dollars less. Nothing interesting to me this week.. Oh well E-Shop will be here soon it will make up for it. @Tasuki - don't recommend the PS1 version of FF3 to someone....that's like recommending the PS1 version of Chrono Trigger. Ruined sound effects, slightly altered music, and load times all over the place. And yeah....tracking down old SNES games is nigh-useless for non-collectors these days. I've taken immaculate care of my NES games and that, combined with luck, resulted in NES and SNES games with still-functioning save batteries. Buying games from that era now, used, seems like a horribly low-success-rate gamble. No love here for Art of Ink? I think the rest of the update is pretty crappy but after watching the vid for Art of Ink I'm genuinly interested. If only it was 500 points I would pull the trigger right now! At 800 points I'm gonna need some confirmation but it still looks quite promising. Almost like its appeal is similar to that of Bonsai Barber (a criminally over-looked Wiiware game). Wow Nintendo just stop releasing games on these services. Just constant shovelware anymore. Either do VC games that we want or don't do it all. BOO -5/10 for this week. Try the Fast draw showdown demo, guys! It's such ridiculous stuff, that it's actually fun! I hate MumboJumbo. I just remember that they bought Ritual - the designers of Sin and Sin Episodes (the first game besides Half Life 2 to adopt Steam as a release platform) - and destroyed them. They don't make core games, so why did they have to wreck a promising core developer? F*** those b****s.
@28 The reasons are known. There are such a small amount of games left that don't have licensing issues, defunct developers and/or rights holders, developers who don't want to support the VC, or other issues that if they released one or more every week, their backlog would run out very quickly forcing them to wait a month or two (or even more) between releases.